President Trump's pandering executive order reversing an Obama decision to scale back the dumping of surplus military equipment on the nation's already over-armed police departments includes word that his new "toys (arms)-for-cops" benefit program will include Army and Marine surplus bayonets. Let's ponder that for a moment. The Army gave up bayonets for combat use after the Korean War (the last recorded US bayonet charge was in 1951 in that war). Now, while the Marines still train in bayonet use in boot camp in a bow to tradition, the reality is that nobody actually uses them in combat. So you have to ask: If the military doesn't think that bayonets are needed or useful in actual combat, why would police in the US need them?" 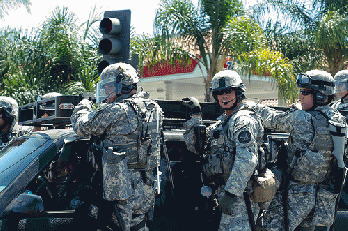 It's a good question and gets to the larger question of why American cops need any of the gear that they're being offered -- once again -- by the US military: everything from RPGs to MRAP "tanks" so heavy that if called out for a SWAT raid, a route has to first be carefully plotted and followed that doesn't cross over any of this country's worn-out and and crumbling bridges and culverts (an MRAP weighs 14-18 tons, while local street viaducts in many communities frequently have tonnage limits in the single digits). Before he retired, I had a conversation with the chief of police of my community of Upper Dublin, a quiet middle-class suburb of Philadelphia, about militarized policing. A thoughtful veteran of the Vietnam War himself, he disabused me of an automatic and commonly shared assumption I had made that local police SWAT teams were probably populated by combat veterans looking for more adrenalin-pumping action. Actually, he told me, combat vets who go into police work -- and there are many who do, thanks to the extra points awarded to veterans by most communities in their hiring -- don't want to be playing soldier when they become police officers. "They've had enough of war and killing," he told me. "It's the ones who have never been in the military who volunteer for SWAT teams." He described such SWAT volunteers as "wannabe soldiers." Maybe if police and sheriff's departments get old Korean War-era bayonets from the Pentagon to mount on their semi-automatic rifles, they'll try launching bayonet charges next time they bust into a house to deliver a bench warrant for a bald tire or missed family court appearance or to look for pot plants, instead of just walking up to the front door in the early morning and bashing it in with a battering ram, as my son witnessed the Savannah Police SWAT unit do trying to arrest a pot dealer who lived next door to him and his schoolmates (the suspect wasn't home, but his little kids were). Next we'll be reading about police stabbings of innocent civilians, instead of their being shot. Maybe that would be a a good thing. A stabbing victim, I should think, would have a much better chance of survival than someone who is the victim of a barrage of bullets fired by an over-excited cop in the heat of urban, suburban or rural "battle." That is unless the cop wielding the bayonet decides to engage in multiple piercing of his victim. Really, this whole thing is getting seriously out of hand. I was just in England, where I had to spend some time in a National Health Service hospital waiting room, and among other things, I got to see an English version of a reality cop show, where the camera was following a couple of bobbies around on their night patrol. I don't know what city it was but judging by the size of the railroad station where the portion of the program I watched took place, it must have been a big one. At any rate, the two bobbies drove up to the train station in response to a call about an apparently deranged man attacking a locked station door and shattering its glass pane. The cops exited their squad car and walked up to the perp. He tried to leave but they gently took him by the arms and restrained him. They kept their voices low and calm and did not draw any weapons (I'm not sure they were carrying guns at all). "Why did you break that glass?" one cop asked him. The man had no answer. The other cop asked him where he lived. When he replied that he didn't have a home, he was told they could take him to social services, which could find him a place.